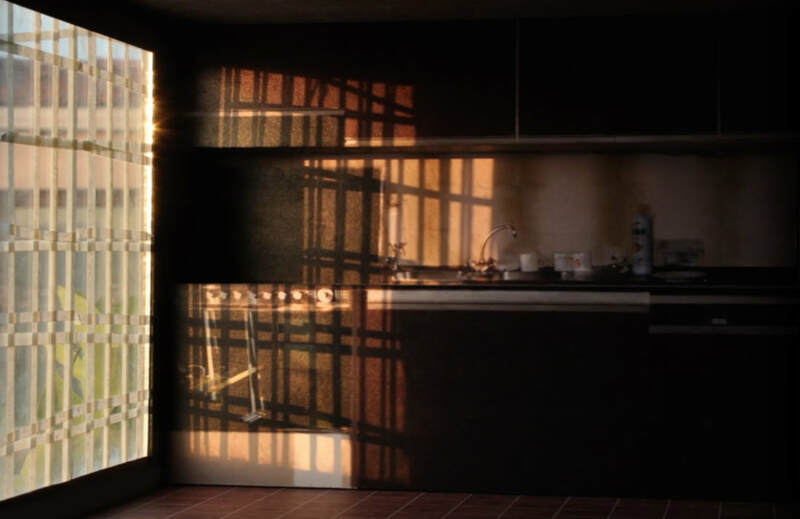 Still from short film ‘Masking Tape Intervention: Lebanon 1989’, kitchen scene with shadow cast by masking tape put on the window to stop glass from shattering during bombardment. The short film takes place in two sections: the first section is a stop motion animation filmed on a model of the kitchen in the Kazan household in Lebanon. The model is generated entirely from a single archive photograph of the kitchen, taken in 1989 just before the family fled the Lebanese Civil War. Discovered again in 2012, the archive image of the kitchen shows the morning sun streaming through the south facing window, casting a distinct patterned shadow across the space through the cross hatched masking tape put on the window to stop the glass from shattering during bombardment. This masking tape becomes a visual demarcation of the exterior threat of the war, and in the film, the tape and its shadow are used as a mechanism to describe the space and the situation to the viewer. The second part of the film is comprised of archive material relating to the violent events leading to the decision to leave, ending with a BBC interview with the Kazan family as they arrive into the refugee centre in Larnaka, Cyprus. The film has been screened and exhibited extensively in Lebanon, UK and internationally.